When I was an Air Force nurse, I worked many a long boring night shift with nothing but a romance novel to keep me awake. I remember thinking at the time that I could write a book, a better book, than some of the cheap novels that were passed around the wards. I kicked the idea around for a while until life got too busy and the quality of my reading material improved. My interest in genealogy was the impetus to begin writing a blog, now I write two. Slowly the idea of writing a full length book floated through my mind until one day I decided to give it a try. 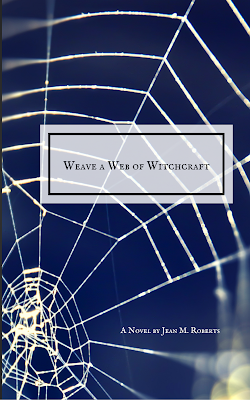 My first book, Weave a Web of Witchcraft went live for sale on Amazon.com on January 8th. I have to say I am very proud of my book, God knows I spent enough time agonizing over it. The book is the story of Hugh and Mary Parsons, a real couple, who lived in Springfield, Massachusetts in the mid-17th century. Hugh was accused of witchcraft and deposed at length by William Pynchon before being turned over to the General Court in Boston. I tried to recreate the world in which Hugh and Mary lived, including details of daily life in those very trying times. If you have any interest in early American history, the Massachusetts Bay Colony, early colonial life, witches or trials, this book is for you. It is currently available only as a Kindle edition, I am hoping to have a paperback version for sale soon. I will post when it is available. If you are interested in the book, click on the book, it will take you straight to Amazon, where you can 'look inside' and see if it is next on your reading list.